Sanders Calls Iraq Worst Foreign Policy Blunder in U.S. History as Clinton Backs Militaristic Views | Democracy Now! On the foreign policy front, the candidates debated the U.S. invasion of Iraq as well as a possible no-fly zone in Syria. “I will do everything that I can to make sure that the United States does not get involved in another quagmire like we did in Iraq, the worst foreign policy blunder in the history of this country,” Sanders said. Clinton backs a no-fly zone in Syria, a move opposed by Sanders and O’Malley. AMY GOODMAN: Our guests are Green Party presidential candidate Jill Stein; Les Payne, Pulitzer Prize-winning journalist; D. Watkins, who teaches at Goucher College in Baltimore and wrote the book, The Beast Side: Living (and Dying) While Black in America. He writes for Salon. And we’re joined in Atlanta by Zaid Jilani, a staff writer at AlterNet. Let’s go to the whole issue of war. The 2003 U.S. invasion of Iraq was also debated in Las Vegas at the first Democratic presidential debate. This begins with Senator Bernie Sanders. SEN. BERNIE SANDERS: I’m the former chairman, Anderson, of the Senate Veterans Committee. And in that capacity, I learned a very powerful lesson about the cost of war. And I will do everything that I can to make sure that the United States does not get involved in another quagmire like we did in Iraq—the worst foreign policy blunder in the history of this country. DANA BASH: Governor Chafee, you were the only Republican in the Senate to vote against the Iraq War. You say Secretary Clinton should be disqualified from the presidency because she voted in favor of using force in Iraq. She has since said that her vote was a mistake. Why isn’t that good enough? LINCOLN CHAFEE: We just heard Senator Sanders say that it’s the worst decision in American history. That’s very significant. The worst decision in American history, I just saw—heard from Senator Sanders. So, as we look ahead, if you’re going to make those poor judgment calls, a critical time in our history—we just finished with the Vietnam era, we’re getting back into another quagmire—if you’re looking ahead, and you’re looking at someone that made that poor decision in 2002 to go into Iraq, when there was no real evidence of weapons of mass destruction in Iraq—I know, because I did my homework—and so, that’s an indication of how someone will perform in the future. And that’s what’s important. DANA BASH: Secretary Clinton, he’s questioning your judgment. HILLARY CLINTON: Well, I recall very well being on a debate stage—I think about 25 times—with then-Senator Obama debating this very issue. After the election, he asked me to become secretary of state. AMY GOODMAN: There you had Hillary Clinton; before that, former Senator Chafee of Rhode Island, Martin O’Malley and Bernie Sanders. Dr. Jill Stein, your response? DR. JILL STEIN: Yeah, I mean, I had to laugh when Hillary said—you know, as if being appointed secretary of state somehow vindicated her bad decision about Iraq, you know, because she just then went on to make all kinds of other really horrific decisions. And she also tried to justify, you know, her regime change in Libya, creating the failed state that it is, you know, and her position was just defenseless. And it felt like we need to acknowledge what an incredible series of catastrophes Iraq initiated. They’re not over yet. And Senator Clinton and, actually, all of the Democrats on the stage continue to support basically the same failed policy. We need an immediate weapons embargo to—particularly to Syria. Clinton was calling for, essentially, an air war. You know, in calling for a no-fly zone, she’s saying, “Let’s have an air war with Russia,” you know, and now we’re talking about a nuclear-armed power. You know, it just felt like she was saying all the wrong things. JUAN GONZÁLEZ: Well, if we can, let’s go to that part where the former Maryland governor, Martin O’Malley, criticizes Hillary Clinton’s call for a no-fly zone in Syria. MARTIN O’MALLEY: And we hurt our—yes. 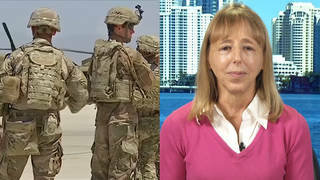 ANDERSON COOPER: Does she want to use of military force too rapidly? MARTIN O’MALLEY: I believe that, as president, I would not be so quick to pull for a military tool. I believe that a no-fly zone in Syria, at this time, actually, Secretary, would be a mistake. You have to enforce no-fly zones, and I believe, especially with the Russian air force in the air, it could lead to an escalation, because of an accident, that we would deeply regret. HILLARY CLINTON: Let me say—because there’s a lot of loose talk going on here—we are already flying in Syria, just as we are flying in Iraq. The president has made a very tough decision. What I believe and why I have advocated that the no-fly zone, which of course would be in a coalition, be put on the table is because I’m trying to figure out what leverage we have to get Russia to the table. SEN. BERNIE SANDERS: Let me just respond to something the secretary said. First of all, she is talking about, as I understand it, a no-fly zone in Syria, which I think is a very dangerous situation, could lead to real problems. AMY GOODMAN: That was the exchange between them on the no-fly zone. Jill? DR. JILL STEIN: Yeah, to say the least, I mean, it could lead to a nuclear war, because if you’re talking about a no-fly zone, it’s not that you might have an accident bumping into a Russian plane, it’s that you’re saying Russian planes, no other planes may fly there. So, you know, that’s going head-on with an armed power. JUAN GONZÁLEZ: And, Zaid Jilani, do you want to comment on that exchange? ZAID JILANI: Yeah, I mean, I think it’s interesting that Hillary repeatedly invoked Obama to try to defend her position at the Democratic debate, because he’s obviously still a popular president among Democrats. And it was interesting that she wouldn’t defend her own positions on their merits. You know, as Dr. Stein said, a no-fly zone at this point would put us in a possible direct conflict with Russia, which is not—which is such an untenable position that actually Obama himself has said that he’s not considering it, and he doesn’t think it’s a realistic exchange.